Erich installed our new 'solar powered dryer' yesterday. 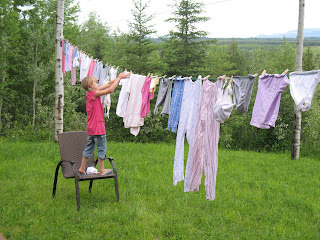 I've never been crazy about the idea of the clothes line...all those crunchy clothes? I know, I know...there is supposed to be a great smell but I just never got it. But, it is hard to deny what an energy hog the clothes dryer is, second only to the refrigerator, so I am happy to give it a go. and this morning she headed out to fold it all! 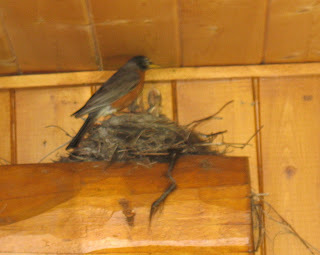 We have been having some fun watching our mama robin feed her babies. It looks like there are 4 babies in there. Sorry it's a little fuzzy...it's hard to catch a picture of mama bird, she is so busy flying around getting food for those babies...ah the joy of motherhood. 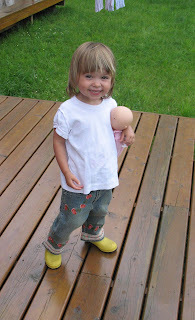 And well this pic is just darned cute...cheeeeeese! 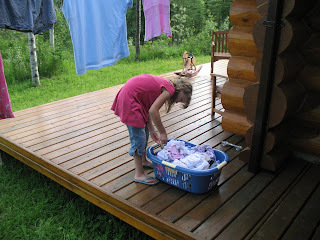 I just love hanging out laundry on the line. The sun, the wind, the fact that it's free! I don't understand why more people don't do it. Now I can usee the solar powered dryer Erich went off to check after our last call! I'm Erich's working colleague in Sydney, Australia. And agree with Heather and Nicola, before you know it you'll wonder how you ever put up with those limp clothes from the electric dryer. One of my greatest shocks over cultural differences was when my friend moved to LA and lived in a closed and luxurious estate but they weren't *allowed* to hang their clothes outside. My friend designed a way to hang inside - lucky her house was so big. But I always felt sorry for her because the clothes didn't get sun kissed.